شهابیان مقدم, رضا, صحاف, سیدعلی, محمدزاده مقدم, ابوالفضل, پوررضا, حمیدرضا. (1396). تشخیص و طبقه بندی خودکار خرابی های روسازی بر پایه آنالیز بافت تصویر در حوزه مکان و تبدیل. فصلنامه علمی - پژوهشی مهندسی حمل و نقل, 9(ویژه نامه روسازی), 121-142. رضا شهابیان مقدم; سیدعلی صحاف; ابوالفضل محمدزاده مقدم; حمیدرضا پوررضا. "تشخیص و طبقه بندی خودکار خرابی های روسازی بر پایه آنالیز بافت تصویر در حوزه مکان و تبدیل". فصلنامه علمی - پژوهشی مهندسی حمل و نقل, 9, ویژه نامه روسازی, 1396, 121-142. شهابیان مقدم, رضا, صحاف, سیدعلی, محمدزاده مقدم, ابوالفضل, پوررضا, حمیدرضا. (1396). 'تشخیص و طبقه بندی خودکار خرابی های روسازی بر پایه آنالیز بافت تصویر در حوزه مکان و تبدیل', فصلنامه علمی - پژوهشی مهندسی حمل و نقل, 9(ویژه نامه روسازی), pp. 121-142. شهابیان مقدم, رضا, صحاف, سیدعلی, محمدزاده مقدم, ابوالفضل, پوررضا, حمیدرضا. تشخیص و طبقه بندی خودکار خرابی های روسازی بر پایه آنالیز بافت تصویر در حوزه مکان و تبدیل. فصلنامه علمی - پژوهشی مهندسی حمل و نقل, 1396; 9(ویژه نامه روسازی): 121-142. ارزیابی عملکرد روسازی یکی از مهم ترین مراحل تعیین استراتژی بهینه، در عملیات مدیریت روسازی محسوب می­شود. در دو دهه اخیر تحقیقات گسترده ای پیرامون توسعه روش­های خودکار، جهت ارزیابی خرابی­های روسازی انجام گرفته است. اغلب این روش­ها بر پایه بینایی ماشین و تکنیک­های پردازش تصویر هستند. 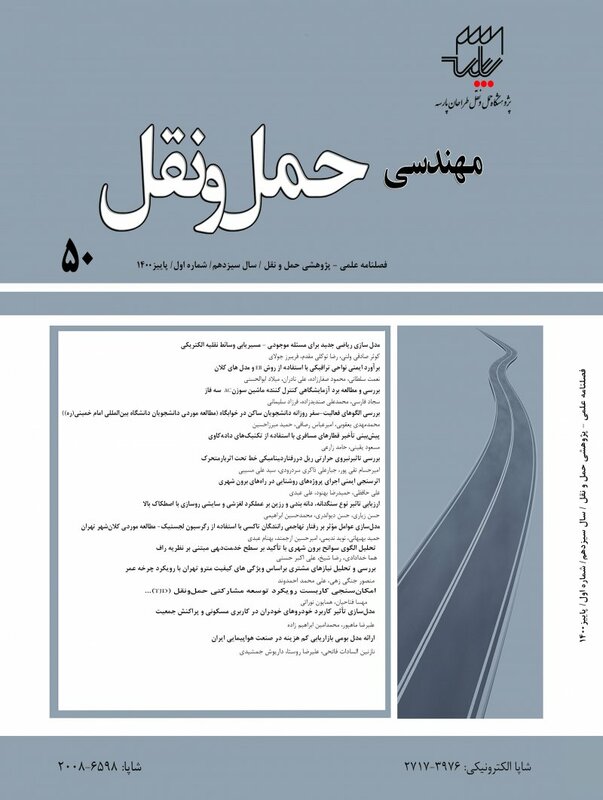 در سال­های اخیر روش های آنالیز چند دقته همچون تبدیل موجک، ابزار مناسبی جهت تحلیل و شناسائی هوشمند خرابی­ها با سرعت و دقتی قابل قبول فراهم آورده است. در این مطالعه، روشی بر مبنای تبدیل موجک به کارگیری شده که قادر به آنالیز صفحه­ای بافت روسازی با در نظر گرفتن اجزای افقی، قائم و قطری بافت روسازی است. در این پژوهش پس از اعمال تبدیل موجک گسسته و جدا­سازی باند­های فرکانسی تصویر توسط چهار خانواده مختلف از موجک­ها، ویژگی­های بافتی زیرباندها بر مبنای ماتریس هم­رخداد سطوح خاکستری استخراج شده و با نتایج حاصل از آنالیز بافت تصویر در حوزه مکان مقایسه گردید. در انتها روش کمینه فاصله ماهالانوبیس به منظور تفکیک و طبقه­بندی تصاویر خرابی در 7 کلاس شامل ترک پوست­سوسماری، آسفالت سالم (بدون خرابی)، ترک طولی، ترک عرضی، قیرزدگی، وصله و عریان­شدگی به کارگیری گردید. نتایج اعتبارسنجی و ارزیابی عملکرد کلاس­بندی حاکی از آن است که طبقه بندی تصاویر خرابی توسط آنالیز بافت تصویر در حوزه تبدیل نسبت به حوزه مکان نتایج دقیق­تری در پی دارد. دقت عملکردی کلاس­بندی تصاویر خرابی در حوزه تبدیل به طور میانگین برابر با 67 درصد بوده درحالی­که دقت طبقه­بندی داده­های خرابی مبتنی بر استخراج ویژگی­های بافتی در حوزه مکان برابر با 76/49 درصد است. در حوزه تبدیل، اگر­چه فیلترDaubechies 2 در شناسایی خرابی قیر­زدگی حساسیت عملکرد بالاتری داشته، اما به طور میانگین فیلتر Haar نسبت به سایر موجک­های استفاده شده، با دقت عملکردی 24/95 درصد نتایج برتری در شناسایی و کلاسه­بندی خرابی­های سطح روسازی آسفالتی حاصل نموده است. -Acosta, J. A., Figueroa, J. L. and Mullen, R. L. (1995) “Algorithm for pavement distress classification by video image analysis”, Transportation Research Record, No. 1505, pp. 27–38. -Busch, A. W. (2004) “Wavelet transform for texture analysis with application to document analysis”, Doctoral dissertation, PhD Thesis, Queensland University of Technology. -Cheng, H. D., Glazier, C. and Hu, Y. G. (1999) “Novel approach to pavement crakingdetection based on fuzzy set theory”, Journal of Computing in Civil Engineering, Vol. 13, No. 3, pp. 270–280. -Chua, K. M. and Xu, L. (1994) “Simple procedure for identifying pavement distresses from video images”, Journal of Transportation Engineering, Vol. 120, No. 3, pp. 412–431. -Dettori, L. and Semlera, L. (2007) “A comparison of wavelet, ridgelet, and curvelet based texture classification algorithms in computed tomography”, Computers in Biology and Medicine, Vol. 37, No. 4, pp. 486–498. -Jiang, J., Liu, H., Ye, H. and Feng, F. (2015) “Crack enhancement algorithm based on improved EM”, Journal of Comput Science, Vol. 12, No. 3, pp. 1037–1043. -Kara, B., Watsuji, N. (2003) “Using wavelets for texture classification”, In IJCI proceedings of international conference on signal processing, ISN 1304-2386, pp. 920–924. -Lee, D. (2003) “A robust position invariant artificial neural network for digital Pavement crack analysis”, Technical report, TRB Annual Meeting, Washington, DC, USA. -Manning, K. and Mohajeri, R. (1991) “An operating system of pavement distress diagnosis by image processing”, Transportation Research Record, TRB, National Research Council, Washington, DC, No. 1311, pp. 120–130. -Moghadas Nejad, F. and Zakeri, H. (2011) “An optimum feature extraction method based on Wavelet–Radon Transform and Dynamic Neural Network for pavement distress classification”, Expert Systems with Applications,Vol. 38, No. 3, pp. 9442–9460. -Moghadas Nejad, F. and Zakeri, H. (2011) “A comparison of multi-resolution methods for detection and isolation of pavement distress”, Expert Systems with Applications, Vol. 38, No. 3, pp. 2857–2872. -Moghadas Nejad, F. and Zakeri, H. (2011) “An expert system based on wavelet transform and radon neural network for pavement distress classification”, Expert Systems with Applications, Vol. 38, No. 3, pp. 7088–7101. -Mulcahy, C. (1997) “Image compression using the Haar wavelet transform”, Spelman Science and Math Journal, Vol. 1, pp. 22–31. -Nallamothu, S. and Wang, K. C. P. (1996) “Experimenting with recognition accelerator for pavement distress identification”, Transportation Research Record, Vol. 1536, pp. 130–135. -Ouyang, A., Dong, Q., Wang, Y. and Liu, Y. (2014) “The classification of pavement crack image based on beamlet algorithm”, in: 7th IFIP WG 5.14 international conference on computer and computing technologies in agriculture, CCTA 2013. -Rezaei, K. and Agahi, H. (2015) “Segmentation and classification of brain tumor images using statistical texture features and SVM”, 2st National Conference on Development of Civil Engineering and Electricity, Iran, 17 Dec, 2015. -Rosa, P. (2012) “Automatic pavement crack detection and classification system”, Transportation Research Board, National Research Council, Washington, D.C., pp. 57-65. -Salman, M., Mathavan, S., Kamal, K. and Rahman, M. (2013) “Pavement crack detection using the Gabor filter”, in: 2013 16th international IEEE conference on intelligent transportation systems: intelligent transportation systems for all modes, ITSC 2013. The Hague, pp. 2039-2044. -Singh, R. (2016) “A Comparison Of Gray-Level Run Length Matrix And Gray-Level Co-Occurrence Matrix Towards Cereal Grain Classification”, International Journal of Computer Engineering & Technology (IJCET), Vol. 7, No. 6, pp. 9–17. -Wang, W., Watkins, H. and Kuchikulla, K. (2002) “Digital distress survey of airport pavement surface”, Federal aviation administration airport technology transfer conference. -Wang, K. C. P. (2009) “Wavelet-based pavement distress image edge detection with Trous algorithm”, Transportation Research Record: Journal of the Transportation Research Board, Vol. 2024, pp. 73–81. -Wimmer, G., Tamaki, T., Hafner, M., Yoshida, S., Tanaka, S. and Uhl, A. (2016) “Directional wavelet based features for colonic polyp classification”, Medical Image Analysis, Vol. 31, pp. 16–36. -Zakeri, H., Moghadas Nejad, F. and Fahimifar, A. (2016) “Image based techniques for crack detection, classification and quantification in asphalt pavement: a review”, Archives of Computational Methods in Engineering, pp. 1–43. -Zayed, N. and Elnemr, H. (2015) “Statistical analysis of haralick texture features to discriminate lung abnormalities”, International Journal of Biomedical Imaging, Vol. 2015, Article ID 267807, pp. 1-7. -Zhang, W., Zhang, Z., Qi, D. and Liu, Y. (2014) “Automatic crack detection and classification method for subway tunnel safety monitoring”, Sensors, Vol. 14, No. 10, pp. 19307-19328. -Zhou, J., Huang, P. S. and Chiang, F. (2006) “Wavelet-based pavement distress detection and evaluation”, Optical Engineering, Vol. 45, No. 2, pp. 2006-2011. -Zhu, Z., Song, R. and Chen, S. (2016) “A novel method of image features extraction and application”, 31st Youth Academic Annual Conference of Chinese Association of Automation, Wuhan, China, November 11-13. -Zou, Q., Cao, Y., Li, Q., Mao, Q. and Wang, S. (2008) “Cracktree: automatic crack detection from pavement images”, Pattern Recognition Letters, Vol. 33, No. 3, pp. 227–238.